With a Harvest Hosts membership (just $49/year), you can stay overnight at more than 600 wineries, farms, breweries and other attractions in North America for free! Harvest Hosts offers a unique alternative to traditional campgrounds, where members can meet interesting people, taste great wines, eat fresh produce and stay in peaceful settings. Learn more here. Today’s brain teaser (answer below): What is higher without the head than with it? Image: Steve Snodgrass on flickr.com. Need new tires for the rig? It may be best to stick with the same tire specification as the original equipment. If you do decide to change specs, make sure you always match up your tire and wheel capacity. For example, NEVER mount a 3,000-pound capacity tire on a 2,000-pound capacity wheel. Saturday Before the Game – Is Your RV Tailgate Ready? Tailgating and RVs go together like fall weekends and football. Enjoy the comforts of home and the company of the crowd! 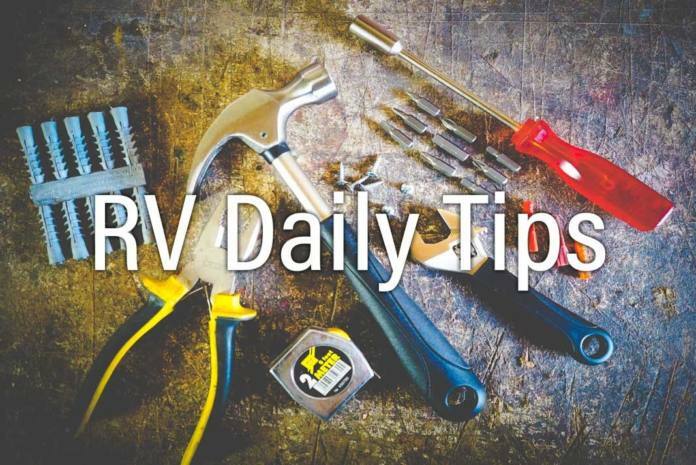 Ensure your RV is ready for the big game by tackling those minor repair jobs before they turn into big ones. Visit your local Lowe’s to stock up on Road & Home™ RV repair and replace parts today. The best things to do in October in the U.S. The title says it all! This article from Travel + Leisure lists the neatest things to do in the month of October all across our beautiful country. This is a helpful article to prepare you for traveling in your RV during the cold months ahead. Lots of good information, including packing lists, winter gear and emergency kits to keep on hand. Editor and Publisher: Chuck Woodbury. Managing editor: Diane McGovern. Staff writer: Emily Woodbury. Contributing writers: Russ De Maris, Bob Difley, Gary Bunzer, Roger Marble, Mike Sokol, Greg Illes, J.M. Montigel and Andrew Robinson. Advertising coordinator: Gail Meyring. Marketing director: Jessica Sarvis. This website utilizes some advertising services. Sometimes we are paid if you click one of those links and purchase a product or service. Regardless of this potential revenue, unless stated otherwise, we only recommend products or services we believe provide value to our readers. Amazon and the Amazon logo are trademarks of Amazon.com, Inc . RVtravel.com is a participant in the Amazon Services LLC Associates Program, an affiliate advertising program designed to provide a means for us to earn fees by linking to Amazon.com and affiliated sites. Previous articleWho are these newbies embracing the evolving world of RVing? I would pay to store my RV, but every place within a 35 mile radius has a waiting list. If I ever win the lotto, I won’t buy campgrounds, I’ll buy parking lots. RV storage seems like a good way to make some income. Headspace is higher without the head as well (space-like the outer alien ? kind)?! What is higher without the head than with it? The level of beer in a full glass. Not sure about others, but when my head is on my pillow, it is higher than just the pillow. If they are considering the head pushes the pillow down, then it would be true. The links in the RVing related websites aren’t working. In response to searching for water leaks in a camper= someone mentioned this awhile back. I found line/fitting leak in our first camper when not connected to city water and pump is on. pump will cycle with NO water used means you need to go find the leak!!!!! Been trying to join the forum put my info in and it told me to check my email for a confirmation, still nothing, how long does it take? That was going to b my commnt! Selective enforcement is entirely actionable in most places. if the only basis is whether someone objects. Laws don’t change based on whether you feel like enforcing them that day. You would have an especially strong case with your ADA infringement (it IS illegal to ban a wheelchair van, for example). I would like to see reviews on randomly selected campgrounds across the country. Go to rvparkreviews.com where you will have more reading than you ever thought about.